Preheat the oven to 350 F and line 2 baking trays with parchment paper. Give the dough one or two kneads on a floured work surface to soften it (this will prevent the dough from cracking when rolling) and then roll it out to just less than ¼-inch thick. 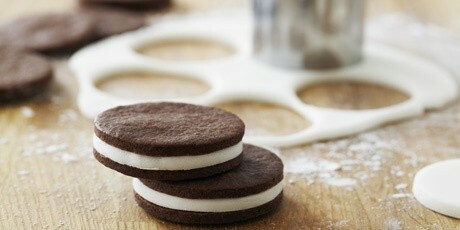 Cut out cookies using a 2-inch cookie cutter and lift onto the baking trays. Any scraps can be re-rolled, and if the dough gets too soft when rolling, simply chill it for 15 minutes before rolling again. Bake the cookies for about 8 minutes, until they loose any shine to them. Allow the cookies to cool on the tray before removing to fill. 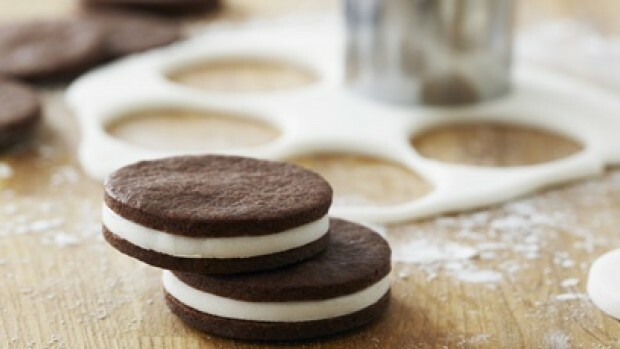 Roll out the fondant, using icing sugar for rolling (not flour) to just over 1/8-inch thickness and cut 2-inch circles using the same cookie cutter as for the cookies. Brush one side of the fondant with a little water and press this onto the bottom of one cookie. Brush the other side of the fondant with a little water and place the bottom of a second cookie, pressing gently to secure the sandwich. Repeat with the remaining cookies, re-rolling the fondant if needed.